If you were to ask someone who knows me what I like to do in my free time, they would probably say one of two things: she likes to ride her bike; or, she likes to eat. (And cook. Also to talk about food. And drink craft beer. While cooking. Sometimes while biking. You get the point.) It therefore seemed imperative that I participate in the 2012 Crocktoberfest competition, a fundraiser for the Boulder Mountainbike Alliance (BMA), sponsored by Sports Garage and Twisted Pine Brewery. Although crockpotting (forgive the invented verb) is usually a solitary activity, there are no food laws that say it must be. So thought Elorie Slater, the marketing director for Sports Garage. “No pun intended, but we cooked up the idea,” said Slater. “Last year after attending an “Octoberfest”, I was playing around with ideas for a fall party, and jokingly said, “What about Crocktoberfest?”. It started as punny brainstorm, and turned into exactly the thing we wanted to do! There is a unique food culture here at SG: we’re open minded and adventuresome, there are friendly competitions between the meat-lovers and vegetarians, and we enjoy each other’s senses of humors. The natural extension of our Sports Garage personality was to do a food-centered event here at our bike shop.” Thus was born Crocktoberfest, whose inaugural year saw close to twenty delectable entries and the potential for many more years of festive crockpotting to come. When I arrived at Sports Garage last Saturday afternoon, their small parking lot had been transformed into a crockpotting staging ground — crockpots outnumbered bikes (outside, at least). I found my spot — next to “Tiramisu” and “What-just-happened-to-my-taste-buds pulled pork,” grabbed an extension cord, and plugged in. As the participants and tasters milled around, sampling each others’ creations, all conversations naturally converged at . . . crockpot cooking. I found that some participants had plugged in their crockpots before heading to bed the night before, while others had begun preparing during the wee hours when night becomes day (admitted my table-mate, whose secret ingredient was beer. Root beer, he clarified.). I had gotten out of bed at 8, chopped my veggies, mixed up the sauce, and set the dial to low by 8:30. There are three dishes that I make fairly regularly in the crockpot during the cooler months. I elected to go with the one I’d been making the longest: a chicken and sweet potato curry. It’s a simple recipe, as all crockpotting should be, selected for this event because it required no pre-preparing, like searing the meat or sauteeing the veggies. Just a pot full of chicken breasts, sweet potatoes, onions, and a simple curry sauce made with spices and orange juice. creator of “Hoppin’ John” (yummy black-eyed pea and pork dish from the dirty south), sits on the board of BMA, and her brother-in-law works at Sports Garage. To her right, the man who made “Asian Delight,” called himself a “friend” of Sports Garage and a rider on their club team. The winner of the silver crockpot for her “Oinker Curry” said she heard about the event from Sports Garage directly — she’s been a loyal customer for three years. 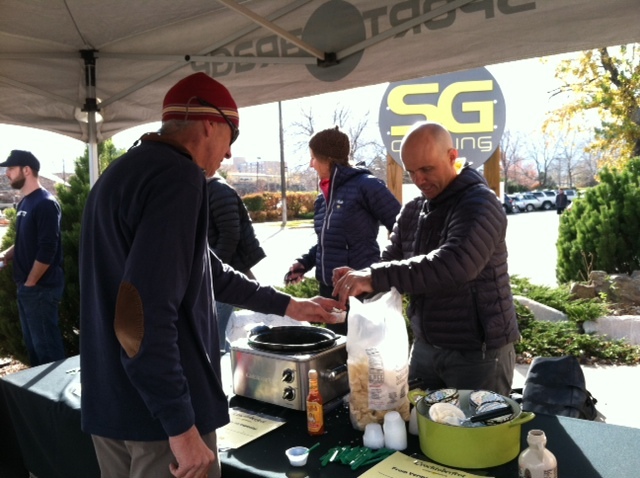 A love of cooking and a love of bikes united us all, and Boulder Mountainbike Alliance (BMA) was there to benefit from the love. Boulder Mountainbike Alliance is a trail buildin’, bike ridin’ advocacy group that’s been around since the early 90s, when mountain bikers weren’t necessarily welcome on most of the local trails. Thanks to BMA’s efforts — and those of its members — Boulder County trails are not only more accessible to bikers, but they’ve got the handprints of hundreds of volunteers etched into the dirt. Mike Barrow, serving as the other judge at Crocktoberfest, is one such example: his sweat equity takes the form of volunteer bike patroller. In fact, I’d seen him riding up at Heil Ranch earlier in the morning. Events like Crocktoberfest serve as a fun way for BMA to interact with both its members — like Sports Garage — and those who ride but don’t know about the super fun group of staff and volunteers who help build trails, have parties, and ride together (BMA)! int. “Once,” said Twisted Pine president and Crocktoberfest judge Bob Baile, “there were about 8 bicycles lined up outside the tap room and not one single car. The biking community is big on beer, and that community is important to us.” Baile said that Twisted Pine has helped raise over $20,000 this year for various community-focused groups. Food is the ultimate fundraiser, beer goes well with food, and both are best appeciated after a bike ride. The Crocktoberfest trifecta definitely has a future in Boulder, where riders can don chef whites, chefs can wear Spandex, and everyone can enjoy a crocktail by the crockpot. creative. bold. awesome. congratulations to the creator of an event that should have a deep history bikes.